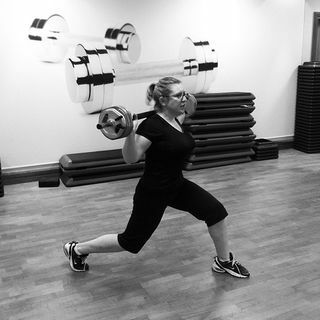 I recently wrote about my gym challenge over here on Spikes & Heels. I’ve done over 600 gym sessions now and my enthusiasm is still fresh for it. Alas, the same cannot be said for my shoes. In fact, I’ve had the same gym shoes for over 10 years now. Since I mainly do BodyPump and BodyCombat, it’s all indoors so your shoes don’t take the pounding they might if you were running outdoors. Even so, my shoes were fraying at the toes and definitely in need of a refresh. And then, in an act of serendipity that almost never happens, I got offered a pair of sports shoes to review from the aptly named Sports Shoes dot com. Now, the first thing you need to know about this Sports Shoes site is that they don’t just sell sports shoes. That would be too obvious. You can get the whole kit, from sports bras to shin splint sports supports (try saying that when you’re out of puff). But sports shoes they certainly do have – lots and lots of sports shoes. Too much, almost. I started off in the running department and found there were 229 pairs in my size alone. I found it a bit overwhelming. So I narrowed the search down to Nike (cos that’s what my previous sports shoes were, and they turned out pretty well). From there I applied my usual fashion manifesto: If the White Stripes were to reform and needed me to go on tour with them, what would I wear? 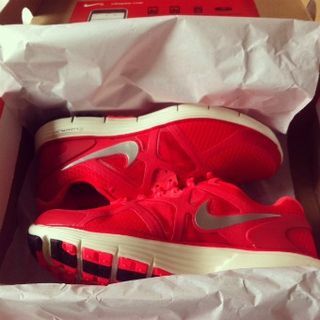 So that led me to these red devils, or to give them their full title, Nike Lady Lunarglide+ 3 Running Shoes. RRP £84.99, currently reduced by 20% to £67.45 (I wasn’t paying, but I didn’t want to take the piss). They turned up a couple of days later, and were more pinky red in the flesh than they look in the site photo. The laces and the cushioning at the back of the shoe are virtually luminous pink. What will The White Stripes think? I wondered. When we go on tour, I mean. I guess I’ll deal with that when it arises. They’re incredibly lightweight but supportive, and will take the Nike+ sensor for people who like boasting on Facebook about how far they’ve just run. Every time I wear them, I get compliments, from people I have been sharing gym classes with for years who’ve never actually spoken to me before. Who knew that new sports shoes were as much of a social lubricant as white wine? 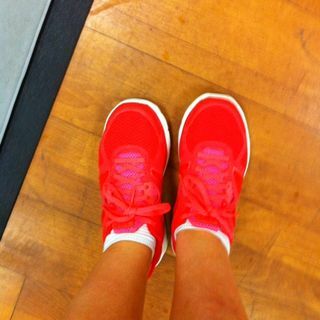 And – get this – the first time I wore these shoes to the gym, another fellow gym-goer ACTUALLY PUT HER OWN SHOES IN THE BIN. Really. I am not making that up. These are super-handsome shoes. I like them so much I dyed my legs to match the gym floor. What I like about SportsShoes.com is that, as well as an enormous choice of products, there’re some great technical tips and advice videos to help you choose the right shoes. Plus my inner stingy person likes the fact that there are lots of discounts on big brands (not just the left over stuff that no one wants), and you can pick up some great bargains without having to wait for the sale. Might just get another pair, and not wait 10 years this time. Oooh, as someone who loves shoes, particularly in pink or red, and especially if they’re bargainous, AND has recently taken up running, you may have written this post especially for me. Thanks! oh what a nice shoes! i love that very much.Joanne u look so much gorgeous in shoes.take it up.thanks for ur nice article. I think the shoes look great! the flair on them really stands out!